If you've been holding out for the iPhone 5 on T-Mobile, be prepared to continue waiting. T-Mobile's chief marketing officer, Cole Brodman, reportedly told employees at a town hall meeting that the iPhone 5 will not be part of the carrier's holiday lineup. "We are not going to get the iPhone 5 this year," Brodman said. 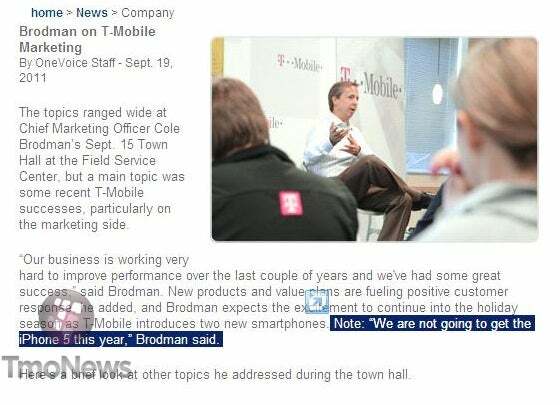 Brodman's quote was published in T-Mobile's Intranet newsletter, OneVoice--and a leaked screenshot of the newsletter was posted on TMONews. If this rumor is true, T-Mobile will be the only major U.S. carrier not carrying the iPhone 5 this holiday season. 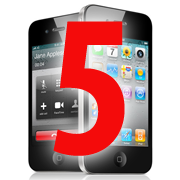 Bloomberg and the Wall Street Journal have both reported that Sprint, AT&T, and Verizon Wireless will all be selling the iPhone 5, which Apple is expected to launch in October. Instead of the iPhone 5, T-Mobile customers will be able to purchase an unlocked iPhone 4, directly from Apple, for $649. 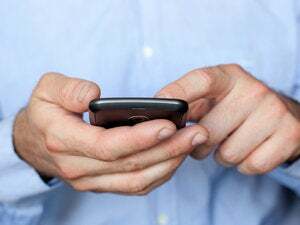 Although the unlocked phone is more expensive initially, T-Mobile subscribers can save money by using the carrier's "Value Plans," which provide discounts on monthly bills if you have your own (non-subsidized) phone. Keep in mind, however, that unlocked iPhones don't support T-Mobile's 4G or 3G networks, so data will be slower than on other data providers. Otherwise, T-Mobile customers will have the usual mix of Android phones, Windows Phones and Blackberry phones to choose from. In the leaked newsletter, Brodman also said T-Mobile will introduce two new smartphones before the year is over. With that in mind, T-Mobile subscribers may want to wait until mid-October before upgrading, anyway. After all, nothing's official until Apple says so (or doesn't), and the worst thing that could happen is that there are more phones to choose from as wireless carriers roll out their holiday lineups.